Simone Anderson is a 24-year-old from New Zealand, and she has spent the past two years completely changing her life. According to the i100, Simone started her transformation journey on August 29 2014 weighing in at 26st 6lbs (169kg), and now she has lost well over half od that amount reaching a little over 12st (77kg). Simone has also explained that the change was born out of a ‘common sense’ approach to dieting. I have always struggled with my weight and have often resorted to easy fix diets where I would lose a lot of weight but as quickly as I lost it I would gain it back and more…making this a public journey will aid so much in motivating me and keeping me accountable for my actions. I don’t have a specific diet plan or one way of eating… I eat all types of food and try and mix it up so I don’t get bored. I don’t eat junk food and I try and stay away from too much processed sugar. The rest is just common sense everything in moderation etc. She has also radically altered her exercise routine and packed it full of a variety of activities. I play three sports; netball, basketball and water polo. I do classes at the gym… have one personal training session each week as well a boot camp once a week. 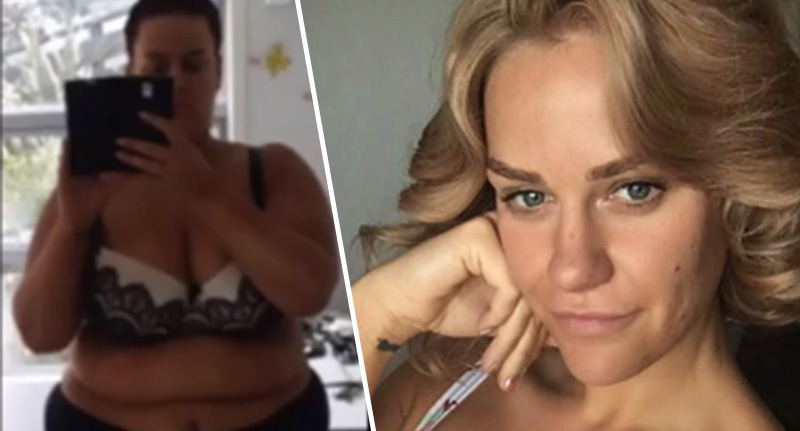 Simone is now almost unrecognisable in appearance to the person she was two years ago, and has gained over 205,000 followers on Facebook, and another 199,000 on Instagram to watch her progress. The New Zealander has gone under the knife in her bid to get into shape, but the majority of surgeries have been to remove excess skin resulting from the weight loss. Her viral fame has become so strong that she is using her social media channels to help support others on their road to a healthier life. I honestly love hearing your stories, so proud of you all! @magfish21 "Hey Simone, I just wanted to take the time and tell you thank you so much for sharing your weightloss journey so publicly! I stumbled across your page back in Oct of last year which was right around the time that I had been looking into my gastric sleeve surgery. I'm so glad I did! you helped me stay motivated. To this day I still look at your before and after pictures that I have saved on my phone to keep me going! I had surgery in January and I'm working hard! Thanks again for sharing! ❤️❤️❤️" Head to www.journeytohealth.co.nz for inspiration and motivation! What an incredible example Simone is setting, and sharing her story is clearly helping an army of others too!